It's early in the year to be harvesting stuff, but my indoor vegetable gardening experiment turned out really well so here we are! The south facing window above is usually filled with houseplants. 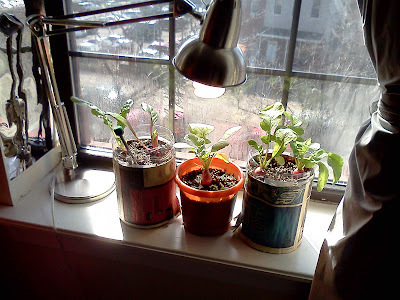 I've noticed the plants in this window grow steadily throughout winter (other plants in darker locations do not) so they gave me the idea to try to grow vegetables indoors when it's too cold to go out on the roof. Vegetables require more light to grow than houseplants so I added some things to the window to maximize light exposure. For supplemental lighting I added a desk light with a cool white cfl bulb. The light is set on timer for 16 hours a day. On the left side of the photo you can see some mylar taped to the wall, it's the same on the other side of the window. Blackout curtains on the right side of the photo finish out the setup. The goal is to reflect light onto the plants. The white colored blackout curtains are kept closed at all times. Both the mylar and the white curtains bounce as much light as possible back onto the plants. Recreating this setup is very easy. Any desk light will work as long as the neck is long enough for the bulb to hover directly over the plants. Stack books under the lamp base if you have to. Blackout curtains are not strictly necessary, any light colored curtains will do. Mylar is also not strictly necessary, aluminum foil will work just as well. A south facing window is best, as it gets the most direct sunlight. Any other window would probably need more supplemental lighting than one desk light can provide. 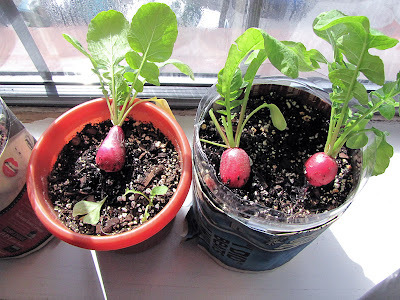 The radish on the left was planted in a standard container and the two on the right were planted in a small, diy self watering container. In the future I'll be using these tabletop self watering containers exclusively, they last much longer between waterings than standard containers. Sorry, I forgot to label the radishes after I planted them so I can't tell you what's what. They were all tasty regardless. I'll be starting seeds soon so this experiment is on hold for now. When I resume it I'm going to try a few more root vegetables and then, if I'm confident in the results, I'll upgrade to fruiting vegetables. Can you imagine eating cherry tomatoes straight off the vine in the dead of winter? What a treat! I'm trying to put these thoughts out of my mind for now, I need to get through spring and summer on the rooftop first! Update: I now have a grow light which has replaced the desk light. Thanks for sharing the results of your indoor gardening experiment. I am fond of planting my vegetables in containers and it is indeed a great pleasure once you have reaped what you planted.